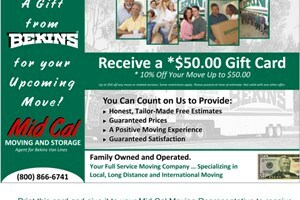 Bekins Van Lines and Mid Cal Moving & Storage have been helping Danville residents move all over the world since 1891. Our Danville movers are courteous, hardworking, and always strive to make your experience as seamless and stress-free as possible. Whether you're moving locally, long-distance, or even on an international scale, our partnership with Bekins -- one of the largest and most trusted van lines in the industry -- gives us the resources we need to handle virtually any household or commercial move. Mid Cal has also earned an "A+" rating with the Better Business Bureau and holds memberships with both ProMover and the American Moving & Storage Association. Call us to speak with a friendly Customer Support Specialist about our world-class services today! For more information on Mid Cal Moving & Storage and the comprehensive Danville moving services we offer, call us today or fill out the Quick Quote form above for your no obligation estimate.